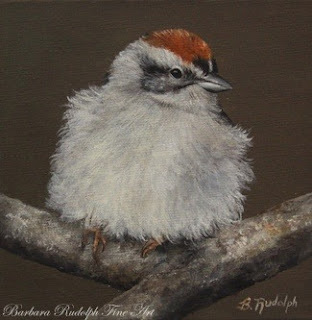 I chose to paint a "Chipping Sparrow" for the letter "C" in the "Alphabet Mini's Painting Challenge". "Chipping Sparrows" have always been one of my favorite "songbirds" to paint with their nearly white and fluffy feathers and a chestnut crown. This little oil painting is painted on a 4x4" canvas panel. I have a group of custom frames being made up for some of these new small paintings. I will post some of the framed ones as soon as I get them ready, and then the little oil paintings will be for sale. Several other artists are participating in this painting challenge throughout the month of June. Check back in to see more of them throughout the month.